Raised to be a warrior, seventeen year old Eelyn fights alongside her Aska clansmen in an ancient, rivalry against the Riki clan. Her life is brutal but simple, fight and survive. Until the day she sees the impossible on the battlefield, her brother, fighting with the enemy. The brother she watched die five years ago. She is given no choice but to trust Fiske, her brother’s friend, who sees her as a threat. They must do the impossible, unite the clans to fight together, or risk being slaughtered one by one. Driven by a love for her clan and her growing love for Fiske, Eelyn must confront her own definition of loyalty and family while daring to put her faith in the people she’s spent her life hating. The Aska villages strengthen for battle every five years in the name of Sigr, including seventeen year old Eelyn and her father. Occupying the coastal villages of the fjord, it is an honour for a warrior to represent her clan, wielding her weapons beside Mýra, her friend and fellow warrior. Five years after the loss of her brother during battle, he is seen in the forest depths, ending the lives of those who wept for the young man taken from their community, now warring alongside those he had once vowed to destroy. Seventeen year old shield maiden Eelyn is gallant and courageous, an Aska warrior compelled by the memory of her deceased brother. Five years has elapsed as the violent crusade commenced in the name of Sigr, as Eelyn strengthens her resolve alongside her father and friend Mýra. The Riki converge to defend their honour and sanctity when Eelyn is overwhelmed by a Riki combatant, shielded by her brother upon the killing fields of Hylli. Her brother whose body was ostensibly forsaken to the wintry landscape. Eelyn is wounded and captured by Fiske, a Riki warrior and kinsman to Eelyn's brother, transported to the village of Fela. Eelyn is hostile, denouncing her brother who has brought disgrace upon her family, the Aska and Sigr, the Scandinavian deity. An Aska warrior is a disposable commodity and to ensure Eelyn's protection while recovering from her wounds, Eelyn unwillingly becomes a dýr of servitude, to be traded after the winter dissolves. Eelyn is placed in the steel collar of a dýr and although Fiske's family are initially mistrusting, Eelyn is only expected to perform domestic duties rather than sexual as the narrative insinuates. The Aska and Riki are being decimated by the Herja. The Herja are ruthless and inhumane, indiscriminately pillaging villages along the fjord by massacring entire communities. It is a moment of unification for the Aska and Riki villages, centuries of conflict have created a prejudice between alliances and to reconcile will ensure the survival of both communities. I enjoyed the broad mythology of the Viking Iron Age despite being devoid of any significant historical information. The narrative appears to take place within the Nordic Viking Scandinavia homeland rather than maritime, although the Aska villages are situated along the fjord, a ravine created by a glacier. The native language used is also fictionalised throughout the advanced readers copy and I hope the finalised novel will provide readers with a glossary. Sky In The Deep is magnificent. I was captivated by Eelyn and her resistance, her strength and humanity. The prose is captivating, the fictional wintry Scandinavian landscape is beautifully cinematic, exhilarating and atmospheric. It's brilliant Ailyn, so fierce and atmospheric. Can't wait to see what you think of it! I just got approved for this one, and I'm very excited to see your review and rating. I'm intrigued by the Vikin mythology and the main character's strength. I can't wait to read it! The storyline is based on the Viking era but without the historical significance and with fictional characters. There was one incident of attempted assault but I was relieved that it wasn't used throughout the storyline like the television series does. It needed to be longer, I would have loved if this was a trilogy. Apparently there's a companion novel coming out though. Can't wait to see what you think of it! I've had an ARC of this for months and I've yet to read it because I'm kind of in a reading slump, so hopefully this will work, great review! This would be perfect! Not only is it captivating but atmospheric and beautifully written. Read it as soon as possible Lily, I can't wait to see what you think of it! It is Lara! It's still available the last time I had checked as well. We need more pirates and vikings in young adult, with girls in positions of authority and power. Give me all the books! What an epic story this is (and cover). I've read a couple of reviews of this title, and each one just makes me curious and ever more interested in Eelyn. She sounds magnificent to be honest. She is, she's brilliant Verushka. 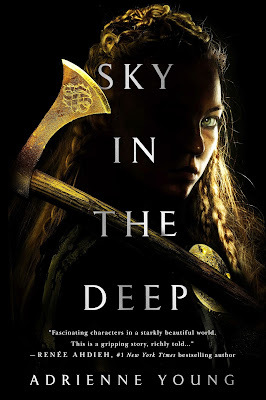 The cover is fierce and represents Eelyn so wonderfully. I would definitely be keeping an eye out, it'll be one of the books of the year! Whew! What a premise. I can see why you loved it, Kelly! It was phenomenal, absolutely loved it and would love to see what you think of it! Oooh this sounds REALLY good! It's fabulous Karen, so fierce! Nice review! Now I'm very interested in this book. I don't think I've ever read any Viking fiction and I would like to. This sounds wonderfully exciting. I hadn't before this either actually, not in young adult. Rick Riordan's Magnus Chase series explores Norse mythology but nothing as fierce as this. I absolutely loved it and would to see what you thought of it too. Me either Vanessa and it was brilliant! Definitely preorder this one, you won't be disappointed. This sounds great, and I'm glad you loved this Kelly! I'll have to check out a copy at some point. I'm curious to see if I'll like a Viking-based story hahaa. I was sceptical but love strong characters and females dominating in what are seen as traditional male roles and it definitely didn't disappoint. I love the cover for this! They synopsis is intriguing, and definitely not something I've read before! You saying things like "cinematic" and "exhilarating" make me think this would be something I'd like. Adding it to my list! The cover is what originally caught my eye on Goodreads, I love me some bad assed heroines. I can't wait to see what you think of it! This book sounds amazing! How have I missed this one? I admit, I would have liked a bit more background which seems to be lacking with little historical background but I think the story and book itself more than makes up for that. I will totally be buying this and it's on my Goodreads TBR now. It's not out just yet but I believe it's still up on Netgalley. I think you'll absolutely love this one! I love the sound of this book with the rich setting and the history of the vikings and everything. Lovely review Kelly!